japanese practice takeshi hirobe architects has sent us images of ‘m-house’, a three-storey house in a busy neighbourhood of tokyo, japan. abiding by the strict building regulation of the site, the design aims to connect the interior with the exterior while maintaining privacy for the inhabitants. during the early stages of the designing process, an octagonal staircase was inserted into the floor plan as a major structural pillar to the house. 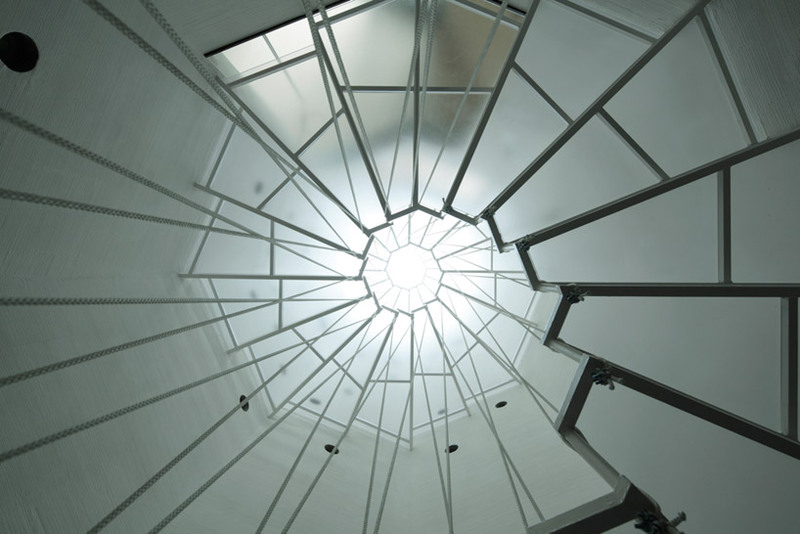 constructed with reinforced concrete, the spiral stairwell is topped with a roof light which allows is to double-function as a lightwell. the interior surfaces are also finished in white to maximize the natural daylighting effect, bringing it all the way down to the basement. round holes of various sizes are randomly perforated on the sides of the shell to establish internal visual connections to each floor. to further introduce the outdoors to the living space, multiple volumetric voids are carved out as outdoor terraces from the corners of the layout. the exterior shell of the house wraps around these spaces, acting as a fence-like barrier from the street. all storeys of the house remains open and flexible, generating living spaces that are flexible yet private when needed. great architecture, very modern, beautiful.. love it..
Fabulous. Has maiximized light in the limited area and space has been utilized very effectively with trendy taste. Interiors are beautiful, calm and untroubled. Spaces seemingly well defined.